Momentum is gathering in the January transfer market with Manchester United being linked with some fresh names. On Monday, we saw links with a certain Cagliari midfielder named Nicolo Barella develop, with Chelsea also thought to be interested, as per the Manchester Evening News. It can be difficult to keep track of every name, especially those you’re not too familiar with, such as young Brazilian goalkeeper Gabriel Brazao. The 18-year-old is currently on the books at Cruzeiro, a Brasileirão Série A side, but is now reportedly attracting interest in the Premier League with Manchester United and Arsenal believed to be monitoring the situation. According to TeamTalk, United and Arsenal are preparing a move for the teenage goalkeeper, supposedly in the region of £3 million. They also note that Serie A giants Inter Milan and Roma are tracking are tracking the youngster. 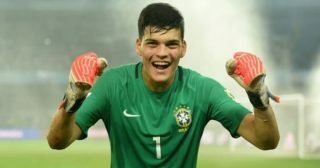 The young shot-stopper won the Golden Glove at the U17s World Cup in 2017, and is now being tipped as a ready-made replacement for to succeed fellow countrymen Ederson and Alisson Becker in the national side. Brazao will also be looking to replicate their successes in Europe and more specifically in the Premier League. Joel Pereira, 22, is currently on loan at Vitoria de Setubal and was highly-rated by former manager José Mourinho. The Reds also have the best second choice keeper in the league in Sergio Romero, who must be on serious money at the club to sit happily on the bench because the Argentine is certainly good enough to be playing most weeks elsewhere. So, there are good options already at United but we don’t see any harm in competition. Let’s bring Brazao to United if he’s as good as they’re making him out to be.